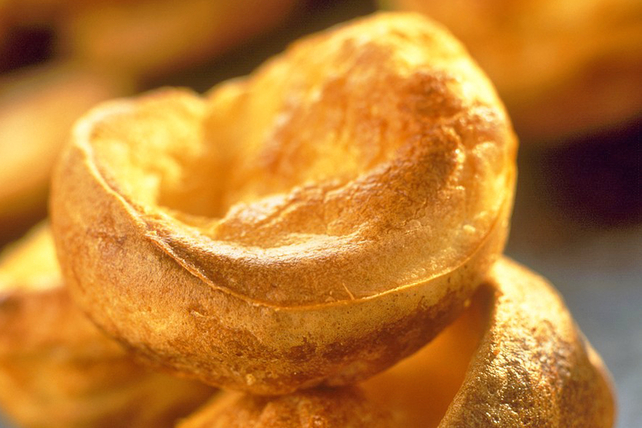 Looking for a Yorkshire pudding recipe with a twist? Try our recipe for Parmesan Yorkshire Pudding. The Parmesan adds great flavour and aroma to this classic recipe. Spray 8 hot muffin pan cups with cooking spray. Spoon batter into prepared cups, adding about 1/4 cup to each. Bake 15 min. Reduce oven temperature to 350ºF. Continue baking puddings 20 to 25 min. or until tops are puffed and golden brown. Transfer puddings from cups to wire rack. Use sharp knife to cut slits in top of each pudding to vent steam. Serve warm. Prepare as directed, adding 1 Tbsp. finely chopped fresh rosemary leaves to flour mixture before mixing with the egg mixture. Serve with cooked roast beef, cooked carrots, sautéed green beans and mashed potatoes. Be sure to let the puddings bake 35 min. before opening the oven door to check on the doneness of the puddings. Opening the oven door before then could cause the puddings to sink in the centres.